If I said The Bees were masters of space and time, you may imagine them to sound something like Hawkwind. They don’t – but I suspect they have heard a fair amount of Hawkwind. In fact, they’ve probably listened to more records than just about any other band around – absorbing such an extensive array of influences from the popular music of the last 50 years that, listening to their albums, one finds oneself constantly attempting (usually unsuccessfully) to join the sonic dots. The Bees’ genius lies in their ability to sew beautiful new garments out of tired old rags. Some touchstones are immediately obvious – take for example the momentary snippet on ‘Change Can Happen’ where the phrasing and even lyrics are suddenly lifted from ‘That’s The Story Of My Life’ (Velvets’ 3rd) or consider how the fadeout of ‘Silver Line’ recalls the gassy euphoria of The Monkees’ ‘Teardrop City’. The Bees are masters of time because the spectrum of influences from which they have drawn – early Pink Floyd, Incredible String Band, Ravi Shankar, CSNY, Shack, roots reggae, Tropicalia et al – is not flaunted unashamedly, but is rather woven so inconspicuously into the band’s sound as to make it unmistakably their own. And against all the odds, their music sounds peculiarly modern. 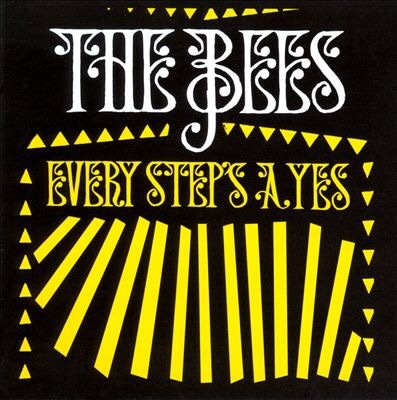 ‘Every Step’s A Yes’, their fourth LP, bears all the time honoured hallmarks of the ‘classic album’ – clocking in at 42 minutes (unusually short for the digital age), it’s ten beautifully crafted songs make for a brilliantly eclectic amalgam of sounds: slow ones and fast ones, toe tappers and ballads – characteristics of those indisputably great LPs of the past. It’s the kind of album which many of us middle-aged folk might find reassuringly familiar. In that sense it may be expedient to be a more mature listener (in years) to garner a true appreciation of it. And yet I am always struck by just how fresh and immediate it sounds. Sure, you’ll find nothing revolutionary here. When the album was released in October 2010, empires did not collapse, nor buildings fall. In fact, it’s probably fair to say, barely anyone noticed at all. The Bees hail from the Isle of Wight. Perhaps that distance from the mainland has accentuated a sense of ‘otherness’. Because of that, their music betrays not the slightest hint of affectation. I imagine they are less tainted than more connected urban artists by the desire to be fashionable, to be part of a scene, whatever that means these days. They have utilised that space, that separate-ness to its full advantage. They use space in more creative ways too. For instance they recorded their debut album (the Mercury Music Prize-nominated) ‘Sunshine Hit Me’ in a small garden shed. The results – a kaleidescopic potpourri – virtually defied science. As if to emphasise their versatility, they recorded the next album at Abbey Road. The Bees demonstrate masterful control of the way sounds are arranged – the way the instruments move away from one another, at times creating beautifully eerie gaps (the keyboard on ‘Island Love Letter’, the strings on ‘Skill Of The Man’ for example). ‘Every Step’s A Yes’ has a relaxed energy (a ‘more mature’ sound, singer and multi-instrumentalist Paul Butler stated) while triumphantly showcasing their extraordinary palette. The buoyant opener ‘I Really Need Love’ has all the ravishing freshness of a sun-bursting early spring morning – he’s in love and the whole world’s going to know about it (“I wish that love will come/for each and every one/and I know I’m gonna get me some/in the shadow of the sun”) – with a simple breezy acoustic strum for accompaniment the whole thing then takes off in a swirling crescendo of sitars and soaring strings. Alongside a brush of harp and crisp stinging guitar lines, ‘Winter Rose’ succumbs to a prime slice of horn-locking Lovers’ rock. In sharp contrast the stark folk-rock of ‘Silver Line’ could have slipped off the run out groove of Moby Grape’s debut album, while the controlled reverb in the panoramic production of ‘No More Excuses’ is astounding – one moment the guitars are like little ripples of water gently brushing the boats on the shore, the next they are twisting psych fizzballs worthy of The Chocolate Watchband or The Strawberry Alarm Clock. The arrangements here are exquisite (fiddle, harp, sitar, clavinette, harmonica, trumpet all chip in with a cameo appearance) but the production is never for a second over-bearing – somewhere between Syd’s Pink Floyd and Lennon twixt Revolver and Sgt. Pepper, it’s sublime harmonies soar effortlessly past steeples and peaks to scale the heavens. ‘Tired Of Loving’ is a pretty if sorrowful plaint with ear melting West Coast harmonies. Then comes a spellbinding triple salvo: ‘Island Love Letter’ recalls the gorgeous ghostly lullabies of mid-period Incredible String Band or even Vashti Bunyan’s naively delicate charm. ‘Skill Of The Man’ has the sort of languid somnolence which Mick Head strove to perfect on the longer tracks from his superb Magical World Of The Strands LP, except that it is in every way superior. And warmer. And that’s a big compliment. Narcotic oblivion beckons with ‘Pressure Makes Me Lazy’, a blissed out potion of drifting guitars horns and strings. Glorious stuff. The album’s closer ‘Gaia’ (the nearest we have to a hit here), recorded with neo-folk wizard Devendra Banhart, is a rallying climax which abruptly brings to halt the ultra-soporific haze by means of a mariachi flavoured Spanish fiesta, calling to mind the band’s earlier flirtation with Latin sound, their cover of Os Mutantes’ ‘A Minha Menina’. Wish they’d do some more – it’s been too long! It seems Paul is spending a lot of time now doing production jobs in the States. Aaron has other projects he’s working on. Bees are not dead, but finding time to do stuff together is proving difficult by all accounts.